Below are the Top 10 Schnauzer Gifts wanted by their owners. If you are struggling to figure out what to buy someone who owns a Mini Schnauzer, look no further. Schnauzer lovers will adore receiving anything that has to do with their dog. Whether the item is actually for them (breed specific jewelry, home decor items...) or something for their dog (treat basket, dog clothes...). Bottom line - Anything that screams "I LOVE MY SCHNAUZER" will be the perfect Schnauzer gift! One thing about Schnauzers, they're usually a bit spoiled. So for example, when they tire on long walks, they expect to be picked up. The perfect dog gift for these pet parents... a dog stroller. And with so many new features they are easier than ever to use. Designs include dual front wheels and shock absorbers to provide easy turning and smooth rides. See our top-rated dog strollers and buying guide here. If you know a Schnauzer owner who likes to travel about town with their dog (and most of them do) or take them on trips, here is an easy way for them to always have fresh food on hand. This travel container keeps pet food fresh in an easy carry, airtight, food grade plastic container. Just remove the carry handle and pull off the blue food/water dishes. Twist off top and pour! Perfect for quick trips! Includes: Two 1-Quart Bowls1 Clear 4-Quart Food Container. This safety harness secures your pet in the back seat to help avoid injury during sudden stops. American Kennel Club 2 in 1 Seat Belt Harness. Extremely easy to use and versatile. By simply slipping the harness over your pet's head and connecting the clasps around the chest you are all ready to either slide your car's seat belt through the back to buckle your pet in or attach your leash to the metal ring on the back for a safe and secure outing. The AKC seat belt harnesses are made with your dog's utmost safety and comfort in mind. We provide adjustable straps with heavy-duty nylon webbing for a durable secure fit and Sherpa lined chest piece with provides your pet extra padding and support in the event of a short stop. This lightweight harness is made with soft durable material to provide your dog with excellent comfort. It is made out of 100% Polyester Air Mesh, which is light-weight, breathable and very soft to the touch. Available in 12 different colors and 6 sizes. an adjustable chest belt with a easy snap on/off buckle Features a D-ring on the back to hook any standard leash onto it.· Designed to fit comfortably around your dog's neck and chest. A must-have for comfort. A Schnauzer favorite, this toy keeps your dog entertained, active, and busy for extended periods of time, eliminating boredom. Helps to satisfy a dog's natural instinct to search, stalk and capture its prey. Just insert the squeaky squirrels into the tree trunk for your dog to remove over and over again. Durable and long-lasting, includes three squirrels and one tree trunk. 6.5 x 7.5" x 6.5". A hand-held water dispenser is the perfect way for you to always have fresh water readily available for your Mini Schnauzer during those long walks, a day at the park or the beach, hiking, camping, and even in the car. Just flip to open and flip to close. It automatically seals when nested so no leaking. It also comes with a belt clip for easy no-hands carrying. This makes it ideal to strap onto just about anything: A belt, book bag, bicycle bar, etc. Comes in an assortment of colors for you to choose from. Makes a great dog gift for Schnauzers on the go! Okay, let's admit it. Every dog owner dresses their pooch up at one time or another. Even if it's just to take a quick photo. But dog clothes are way more than just cute... they also help pups stay warm in harsh climates and dry on rainy days. And dog boots will protect their paws from being burned on hot pavements or becoming cracked from snow and ice. Whether you need a dog coat or sweater, bandana or neck tie, Halloween Costume or Santa suit... You'll be sure to find something your Miniature Schnauzer will look just adorable in. Every Miniature Schnauzer deserves a soft, cozy dog bed to take a restful nap or a good long sleep. Whether your dog prefers an oval bed, cuddler, couch bed, or an orthorpedic bed... Petco has something for every need. ive your dog ultimate comfort and the softest spot in your house! Check out all the plush dog beds. Makes the perfect dog gift! Now here's the ultimate Schnauzer gift for yourself or a dog loving friend - a customized pet caricature. Just imagine a true piece of art made of your little precious Schnauzer. Just send in a photo along with how you would like the portrait to look like. Perhaps you want your Schnauzer winning a Top Dog Prize or Cooking You a Meal or maybe one done of the two of you. The artists create YOUR vision. What a wonderful and very affordable keepsake that will be cherished forever! This large kit contains 50 pieces so you will be prepared for any kind of pet emergency. Great for everyday use and to take with you when traveling with your Schnauzer. It includes essentials for cuts, bites, ears, feet, scratches and provides extra room inside so that you can customize it for your pet. Such as, your pet’s favorite treats, medications, special vet instructions, etc… All in one convenient soft case. Some of the items in this kit include... a waterproof emergency ID card, a thermal foil emergency blanket, reflective leash, a collapsible food/water bowl, plastic water bottle, plastic pill/vitamin container, alcohol cleansing pads, medicine applicator, fur-friendly vet wrap, tweezers with attached magnifying glass, pet safety guide and more. So there you have it. The Top 10 Miniature Schnauzer Gifts to give and receive! 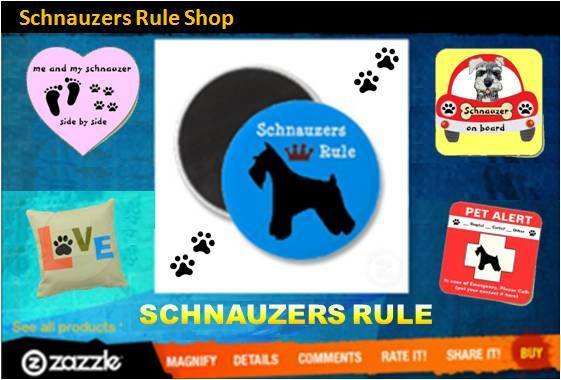 Find more great dog products and offers throughout Schnauzers-Rule.com and be sure to check out our Zazzle store, too!